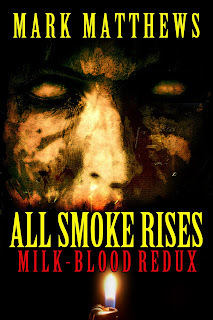 The cover for ALL SMOKE RISES: MILK-BLOOD REDUX is done! Kealan Patrick Burke from Elderlemon Design smashed this one out of the park. You want a cover done, you call him. Ten year old Lilly was the victim of a tragic house fire and her own tragic family. Her father was an addict with mental illness, her mother was murdered and then buried across the street, and her Uncle got her addicted to heroin. Lilly’s story has been told in ALL SMOKE RISES, and it may be true, for the author has broken into your house, and placed her body on your kitchen counter. He demands you read the manuscript, before cutting his own wrists and bleeding out on your floor. Now you have decisions to make, for the body may not be dead, and her family is coming for her. You're books are of great interest to me. I have a son who is in prison related to his heroin addiction since a teenager and is now 35. I have a niece who was pregnant and using with both her kids and they were removed by CPS. There is mental illness in my family as well. I am a recovering addict alcoholic with bipolar disorder, anxiety and PTSD. I see you friended me on Goodreads and your books are on my TBR list. I'd be happy to read and review any or all of your books.